In our opinion, any day is a good day to think about keeping your teeth and gums healthy. However, the month of October is extra special. October is National Dental Hygiene Month (NDHM). The American Dental Hygienists’ Association (ADHA) has partnered with the Wrigley Oral Healthcare Program (WOHP) to create programs in support of the efforts of dental hygienists. The goal is to increase public awareness about the importance of maintaining good oral health. The emphasis for 2017 is on the four components of proper oral health maintenance: brushing teeth twice daily, flossing every day, rinsing with an antimicrobial mouth rinse, and chewing sugar-free gum. We may not always be able to brush after every meal, but cleaning at least twice a day is an efficient way to improve dental health and prevent tooth decay. Make sure to chose a soft brush toothbrush. Also, avoid vigorous brushing. It is best to brush your teeth for at least 2 minutes with a fluoride toothpaste. Lastly, it is important to replace your toothbrush often, around every three months. Did you know that proper dental health affects your overall well-being? Research has shown possible associations between oral infections and certain types of disease such as diabetes and cardiovascular disease. Flossing is a vital component that ensures healthy teeth and gums. While to many it may seem like a chore, in reality, it takes only minutes to complete! 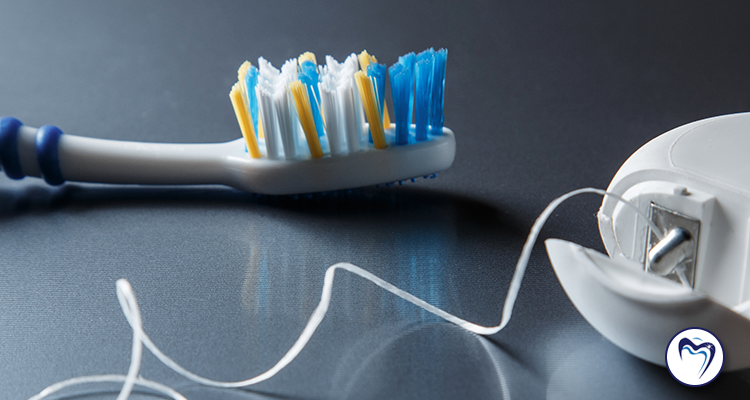 Click here for an easy to follow, step-by-step guide for flossing your teeth. Ok, so that is a mouthful to say. What exactly is antimicrobial mouth rinse? Quite simply, it is what you would typically refer to as mouthwash. When bacterial plaque is not thoroughly removed from your teeth and around your gums, you may start to notice signs of gum disease. While many people may use cosmetic mouthwash to freshen their breath, if you are rinsing with a formula that kills germs, it offers a double whammy. Many OTC products even offer up to 12-hour protection, even after eating and drinking. If you start to notice visible signs of gum disease, talk with your dentist. He can prescribe an effective rinse or recommend the best brands to purchase at your drug store. When used in conjunction with the other dental hygiene tools, an antimicrobial mouthwash can help keep your gums extra healthy. According to the American Dental Association (ADA) chewing sugarless gum after eating can help neutralize and wash away acids that cause tooth decay. Here’s how. • Chewing naturally stimulates extra saliva. • Increased salivary productions wash away acids. • Increased saliva flow brings with it beneficial calcium and phosphate to help strengthen tooth enamel. The ADA also reports that clinical studies show that chewing sugarless gum for 20 minutes after eating prevents tooth decay. In effect, it also reduces plaque and gingivitis for healthier gums. These components, in conjunction with regular visits to your dentist, will ensure a healthy smile for your entire life. Celebrate National Dental Hygiene Month this October, and every day! Contact Denise Dental Studio of Annapolis to schedule your appointment today. When Should I Worry That My Toothache is Serious?